We have all heard stories of the horrors of sickness from drinking unsuitable or contaminated water when we are away from home. Business trips or holidays can easily be wiped out if we can’t access clean drinking water. Well those stories are a thing of the past! 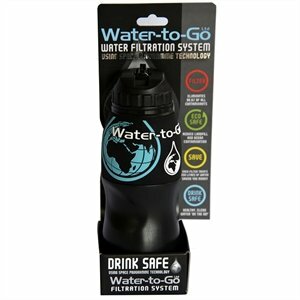 Simply fill up your ‘Water-to-Go’ bottle with water from almost any source*, and our unique, exclusive filter will remove over 99.9% of all contaminants and deliver pure, clean, great tasting water every time! Extreme conditions, really worried about bacterial contamination? Follow the backpackers’ ‘belt and braces’ code, use a chlorine tablet. Here’s where our filter excels! Instead of then consuming all the poisoned bacteria and the poison, the chlorine, our unique dual action filter not only removes the bacteria but also the chlorine along with the smell and the taste. Visit the “Filter facts” section to see just how good our filters are! It’s like travel insurance in a bottle and at a fraction of the price. Stay fit and healthy and enjoy your time away with a ‘Water-to-Go’ water bottle! * our filter does not filter sea waterThe exclusive patented filter, filters the water as it passes through it. It removes 99.9% of all Contaminents. Its unique tiny pores created using nano technology, block chemicals, bacteria, viruses and suspended particles.